During normal operation, the HP and LP valves are open while the equalizing valves and the bleed valve are closed. However, It is critically important that the equalizing valve(s) never be open while both block valves are open! If the process fluid is dangerously hot or radioactive, a combination of open equalizing and block valves will let that dangerous fluid reach the transmitter and manifold, possibly causing damage or creating a personal hazard. Check all valves HP,LP, the bleed valve and the equalizing valves are closed. Open the equalizing valves. This ensures that the same pressure will be applied to both sides of the transmitter, i.e. zero differential pressure. Open the High Pressure block valve slowly, check for leakage from both the high pressure and low-pressure side of the transmitter. Close the equalizing valves. This locks the pressure on both sides of the transmitter. Open the low-pressure block valve to apply process pressure to the low-pressure side of the transmitter and establish the working differential pressure. The transmitter is now in service. Close the HP and LP block valves. The transmitter is now out of service. As is always the case, the transmitter capsule housing still contains process pressure; this will require bleeding. Note that the 3-valve and 5-valve DP transmitter manifolds are usually manufactured as monolithic or single units. The schematics above are just for illustration and explanations. What is Instrument Air Manifold ? 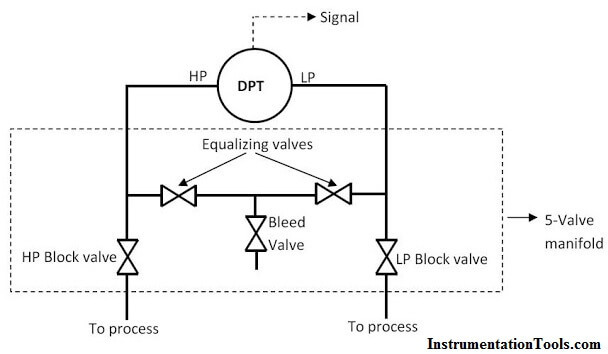 What is Double Block and Bleed Valves ? The first paragraph is incorrect. If both the block and bleed ports are both open the process will bleed out possibly contacting the operator. Not the manifold and transmitter as stated. In 5 way manifold 1 st paragraph you have mentioned both block and equilization valve should not be opened at the same time but the reason is not proper. It should not because as If HP and LP are having differnet process fluid then they will mix together in system. Screw comressor PDI between Seal Oil and Reference Gas.In this case if we open equilization with block valve in opened condition then in compressor gas side Oil will carry forward. Please I what to now, in a DPT transmitter the capsule side of HP and LP are they of the same tensile strain.